Gower, is one of the few areas within lowland Wales where commoners continue to maintain the traditional practices of commoning; grazing cattle, sheep and ponies. In 1999 a partnership of landowners, commoners and conservation bodies was formed in response to the gradual decline in the number of commoners exercising their rights and the effect that this was having on the landscape and ecology of the commons. The Gower Commons Initiative was established with financial support from the Heritage Lottery Fund in 2000, with the aim of restoring the commons for wildlife, grazing, landscape, access and recreation. During the summer the patch work of commons becomes covered with a dense blanket of bracken. The aim was to reduce this problem plant for livestock, walkers and wildlife. Livestock can then graze the previously blanketed areas which encourages the grasses and flowers and suppresses the bracken growth in the following year. Gower Soil Conditioner is a PEAT FREE composted mixture of the bracken harvested from Gower commons and local farm manure; profits from the sale of Gower Soil Conditioner will be used to support the ongoing management of the commons, which cover nearly half of the Gower Peninsula. The reduction in bracken has also meant that the sites now provide easier access for walkers. People can join in practical tasks such as pond creation, scrub management, step building, fencing and installing stiles. The Project also participates in many events at shows, fairs, etc. as a means of raising awareness of associated issues regarding the management of Common Land on the Gower. The National Trust also runs a Community Volunteering project for members of the local community and the wider Swansea area to get involved in its practical work around the Gower. 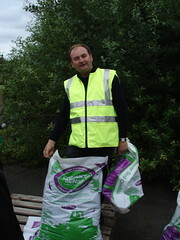 Composted bracken is bagged and sold locally as "Common Sense - Gower Soil Conditioner."